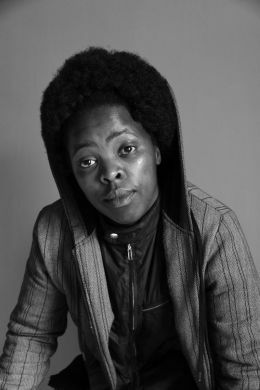 Zanele Muholi is one of the most prominent lesbian activists in South Africa and a world-renowned, award-winning photographer. She is a trailblazer with her images of black lesbians in candid yet intimate poses. She challenges the manner in which black women’s bodies have heretofore been represented in documentary photography. Muholi describes her work as visual activism and an important component in helping create post-apartheid equality. Muholi was born in 1972 in Umlazi, Durban in the KwaZulu-Natal region of South Africa to Ashwell Banda Muholi and Bester Muholi. She is one of five children. Muholi’s 2008 photographic exhibit, “‘Massa’ and Mina(h),” chronicled the life and story of her mother who worked for 42 years as a domestic housekeeper for the same family. She co-founded the non-governmental organization, Forum for the Empowerment of Women (FEW), in 2002. Headquartered in Johannesburg, she worked as Community Relations Officer for this black lesbian group. Muholi also was employed as a photographer and reporter for Behind the Mask, an online news website covering LGBTI (Lesbian, Gay, Bi-sexual, Transgendered, and Intersex) issues in Africa. She finished the Advanced Photography course at the Market Photo Workshop in Newton, Johannesburg in 2003. Muholi’s first solo exhibit in 2004 at the Johannesburg Art Gallery, “Visual Sexuality: Only Half of the Picture,” placed her in the public eye. This exhibit garnered many invitations for feminist conferences, workshops, and exhibitions. For example, she then led a workshop entitled “Gender and Visibility” at the University of Western Cape. Heated audience response resulted in Muholi making the documentary, Enraged by a Picture (2005). Its debut took place at the Out in Africa Gay and Lesbian Film Festival followed by showings at 17 international film festivals including locations in London (UK), New York, Canada, Brazil, Germany, and Korea. Her work has been recognized with numerous awards and fellowships. For instance, she received the 2005 Tollman Award for the Visual Arts. In 2006, Muholi completed the final stage of her second documentary, “Being a Ma,” with the BHP Villiton/Wits University Visual Arts Fellowship. In 2009, she received the Thami Mnyele Residency in Amsterdam (Holland) followed by the Ida Ely Rubin Artist-in-Residence at the Massachusetts Institute of Technology. Other awards in 2009 include Casa Africa for best female photographer and a Fanny Ann Eddy honor from IRN-Africa for exceptional contributions to the study of sexuality in Africa. The 2011 Durban Gay & Lesbian Film Festival recognized her film “Difficult Love” as best documentary. It has been screened in 50 places and won six additional awards. Based in South Africa, Muholi continues to produce documentaries, publish her photographs (three volumes as of 2012), and participate in solo and group exhibitions nationally and internationally. Gabi Ngcobo, “Zanele Muholi,” ArtThrob (December 2006); Claire Breukel, “Depicting an Existence So Far Violently and Blaringly Erased” (interview), Hyperallergic (January 17, 2012); Matt McCann, “Theft Stalls, but Does Not Stop, A Project,” The New York Times (May 23, 2012); http://www.zanelemuholi.com/.